Zylofon Music- recording artist, Stonebwoy, would be the next high-profile Ghanaian musician to star in a movie, and thanks to famed filmmaker, Kobi Rana, – the ‘Bawasaba’ hit maker gets his break in the new movie – ‘My Name Is Ramadan’. Funded by the Zylofon Arts Fund, ‘My Name Is Ramadan’ also features award-winning actors, Kalsoume Sinare and Umar Krupp. The likes of Maame Serwaa, Anthony Woode, Nana Poku Jnr and JKD all play some pivotal roles in the movie. 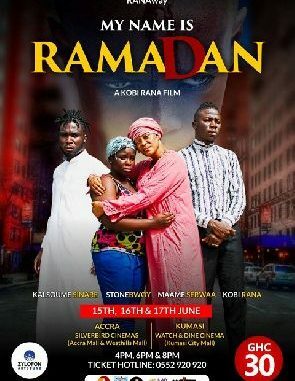 Produced for his RANAway production, ‘My Name Is Ramadan’ will show on 15th, 16th, and 17th June 2018 in Accra and Kumasi simultaneously, at the Accra Mall and the West Hills Mall at the Silver Bird and Watch& Dine Cinemas respectively.